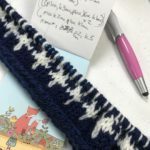 By RedFoxYarns, on June 1st, 2018 In: Store Blog. Last weekend, my mom had the great idea of making a cute little flag-themed dress for the store. 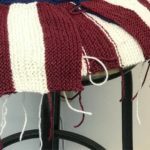 By which she meant, of course, that I should make up a cute little flag-themed dress for the store, and knit it. So, away I went! The first one is finished, except for the weaving in. Now I just have to turn my notes into a pattern, then knit the second one, then edit the pattern, make it pretty, and hand it to mom so SHE can knit one, since it was all her idea in the first place. All before the Fourth of July, so I can release it around then!